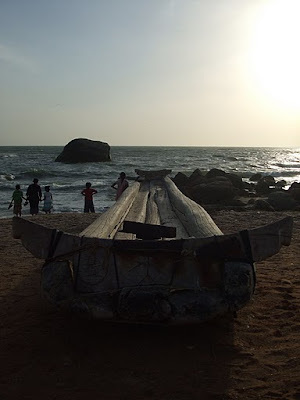 Tales Of A Nomad: Kanyakumari- The Tip of India...!! There are very few places on this beautiful earth where one can witness both the sunrise and the sunset over the horizon. One amongst them is Cape Comorin which is the tip of the Indian mainland. Cape Comorin which is better known as Kanyakumari is the place where the three humungous water bodies namely, Indian Ocean, Arabian Sea and Bay of Bengal meet up. After travelling for about 2 hours from Thiruvananthapuram, we reached the tip of India. It is a crowded little place with shops and hawkers selling shells of various shapes and sands of different colours. A small boat ride from the mainland took us to the famous Vivekananda rock, where the great philosopher had meditated. There are a lot books about his teachings which can be purchased. Next to this stands the massive statue of Thiruvalluvar which has been constructed on another rock. These two are infact the main tourist destinations in Kanyakumari. On the way to these rocks we saw many rocks protruding out of the sea. It could possibly have been a part of the mainland many ages ago. The beach was our next destination and witnessing the lovely sunset, the intention. 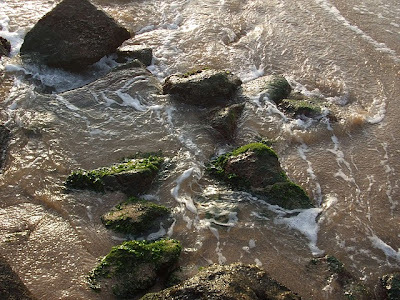 The beach is covered with rocks at quite a few places and many tourists including myself climbed on to it to enjoy the colourful horizon and stare at the dipping sun. We kept gazing at the darkening horizon and enjoyed the moments of solitude. Having witnessed numerous sunsets and a few sunrises, I definitely feel that a sunset is more spectacular than a sunrise. Period...!! Another interesting attraction at Kanyakumari is the 3 different colours of the 3 waterbodies that you can see at one particular location. Shortage of time forced us to leave the same night back to Thiruvananthapuram and miss the next day's beautiful sunrise. 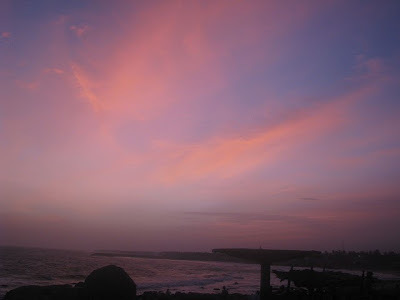 I would definitely like to come back to Kanyakumari some time soon and witness both the visual treats. 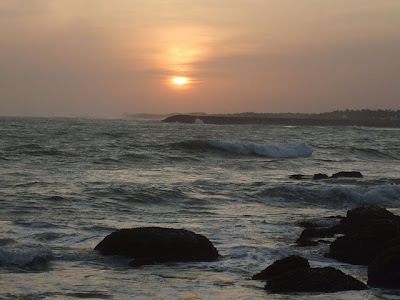 Kanyakumari is not a typical beach town as it has a rocky seafront. Travelers head to this lovely place to witness the spellbinding sunrises and the breathtaking sunsets. It is infact a photographers paradise as it gives them the opportunity to capture the different shades of the sky as the sun rises and sets over the horizon. Signing Note: Witnessing the rising and the setting of the sun makes up for a serene holiday. I've not yet been to the tip. Had been to Trivandrum but missed KK in that trip!!! thanks a lot busha...its a lovely place...head there soon. As I read your posts one by one , realise that there are so many places within India which we miss out on...Hope I can tick against more places the coming year..! India is such a huge country that it would require a lifetime to cover all the places. Keep travelling and you will cover it one by one..
Kanyakumari: the place I discovered 'OM'. Hd been here during my south india trip, aeons back, where v visited Kanyakumari n Maduri, amongst other locations. Frankly I didn't kno who Vivekananda was, and I am no follower of his either, but there was a special meditation room in the island/ashram, which hd a big OM mural/sign on the wall and the room resonated with a voice over chanting OM. That was one of the most significant moment for me, cos I felt @ complete peace with myself that moment and thus started my trust with OM. Once you step out of the meditation room your surrounded by abundance of breeze which takes away all your burden in life. I'd vowed to come back to the place again sometime. Hope it wud become a reality. Another significance is the confluence of the 3 oceans, and yes I noted the different hues as well. Brilliant writing. You brought back memories, which were almost forgotten. @ mridu... thank you. Its an awesome place.keep dropping in. tc. @ raks... thank you... thats exactly the reason why Vuivekananda meditated there... its time to go there again, buddy. This post makes me all the more excited for such a trip... lovely post! I loved the pictures. I have been to Trivandrum, Nagercoil, Padmanabhapuram, Suchindram... but somehow I could never make it to Kanyakumari. @ thatandthisinmumbai...thank you.. Kanyakumari is definitely a must visit. tc. Its an awesome destination. Head there soon. Keep dropping in. Thanks Ismail. Keep dropping by. Haha. There are very few places you haven't been to, Nisha. :). Head to Kanyakumari soon. Oh well, have not even ventured there. And your pictures make me jealous. Glad you liked them. Head there soon.